Hello readers! A friend pointed out to me that "every painting is a SoulPath." In other words, every piece of artwork done from the gut, from the blood, and from the soul tells a story about the individual's spiritual journey. This month's post is about my personal SoulPath. I had put down my paintbrush in March 2017; I wanted to develop my colored pencil skills instead. But a combination of discouraging comments about my work and a busier-than-anticipated piano schedule caused me to put down the colored pencils. September 24, 2017 was the day I stopped making original art. Needless to say, I was strongly guided by a dream in late November to start making art again. (You can read more about it here). I made the first painting, and was so happy just to have my brush moving across the painting again. I felt a little strange when I was doing the sky, but it wasn't until I stepped back and really looked that I saw what was going on. The more I learn about art and spirituality, the more I learn that the heart is the way to the truth. We can live without a brain, ie the body can still persist without brain activity, but we can't without a heart. The minute that baby stops beating, we're done. The head teaches us subjective knowledge, how to navigate through different sets of rules, how to adapt. But out of balance, the head tries to impose too many rules on us, on our heart-growth. It becomes far too critical, and produces condemnations ad nauseum. I was determined to make a better SoulPath so I asked the question, "What would my life look like if I chose my heart over my head?" And the following was the result. Colors are in a way better balance here. All the colors of the chakras are present and with depth and variation. Growth is broad, not one dimensional. Trees are always very special to me, they represent our ability to be grounded and yet always keep reaching for the heavens. 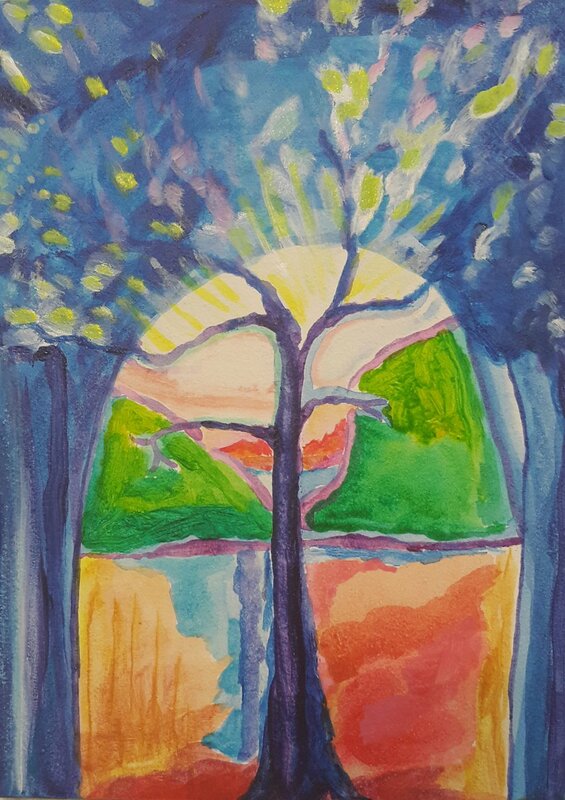 The purple tree shows that being grounded IS the key to reaching, striving, being higher. Did any of my journey resonate with you? Please tell me about it!